Capture of Buna Village had narrowed down the ground still held by the Japanese on the Urbana front, but the main objective, Buna Mission, was still in Japanese hands, and seemingly as hard to get at as ever. The problem was to find a practicable axis of attack, and this the projected operations were designed to provide. Seizure of the island would not only make it possible to bring the mission under close-in fire but might supply a jumping-off point for a direct attack upon it from the south. The Triangle, in turn, would furnish an excellent line of departure for an advance through Government Gardens to the sea, a necessary preliminary to an attack on the mission from the southeast. The fresh 127th Infantry would be available in its entirety for these operations. The 3d Battalion was already in the line and had been for several days. After consolidating at Ango, the 2d Battalion had just begun moving to the front. Companies E and F were on their way there, and Headquarters Company and Companies G and H were moving forward. The 1st Battalion was still being flown in and would come forward as soon as its air movement was completed. swimmers drag a cable across the stream. This expedient worked, and two platoons and a light machine gun section of the company, commanded by Capt. Roy F. Wentland, got across just before noon on 18 December. The attack on the island had failed. The attack on the Triangle was next. This narrow, jungle-covered tongue of land set in the midst of a swamp, and covering the only good track to Buna Mission, was in effect a natural fortress. Improving upon nature, the Japanese had hidden bunkers and fire trenches on either arm of the Triangle and in the track junction itself. To try to storm the junction from the south meant taking prohibitive losses. To try taking it from the north by advancing into its mouth by way of the bridge over Entrance Creek was likely to be almost as costly. There was no room for maneuver in the narrow and confined area east of the bridge, and no way to take the track junction from the south except by advancing through interlocking bands of fire. 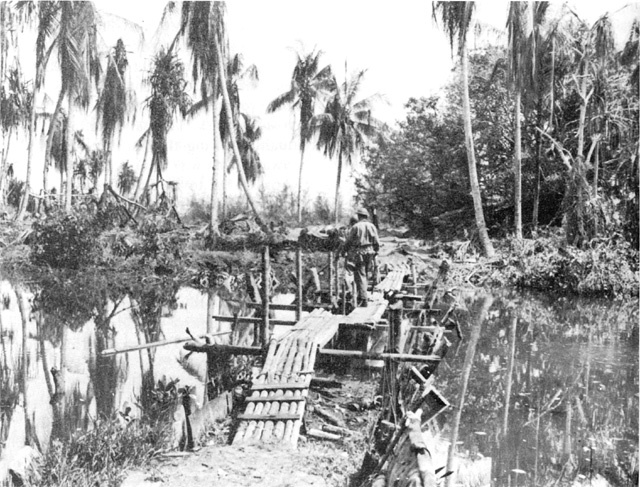 The plan of assault, profiting from the experience gained in an abortive attack on the place by Companies E and G, 128th Infantry, on 17 December, called for two companies of the 126th Infantry to attack across the bridge from the Coconut Grove, and a third company to block the position from the south. The jump-off would be preceded by an air strike on the mission and a preparation on the Triangle itself by Colonel McCreary's seventeen 81-mm. mortars, which were in battery about 300 yards south of the bridge to the island. Since the Triangle was narrow and inaccessible, neither air nor artillery would be used in direct support of the troops lest they be hit by friendly fire. safeguards were taken to ensure that the artillery did not hit the attacking troops. Company E, 127th Infantry, which was to deliver the blow was ordered into the Coconut Grove at daybreak. Its instructions were to remain there under cover until ordered across the creek, over which a second footbridge had been built a short distance from the first. Company F, 126th Infantry, still in place below the Triangle, was ordered to pull back about 300 yards in order to permit the artillery to use the track junction as its registration point. 127TH REGIMENTAL HEADQUARTERS COMMAND POST. 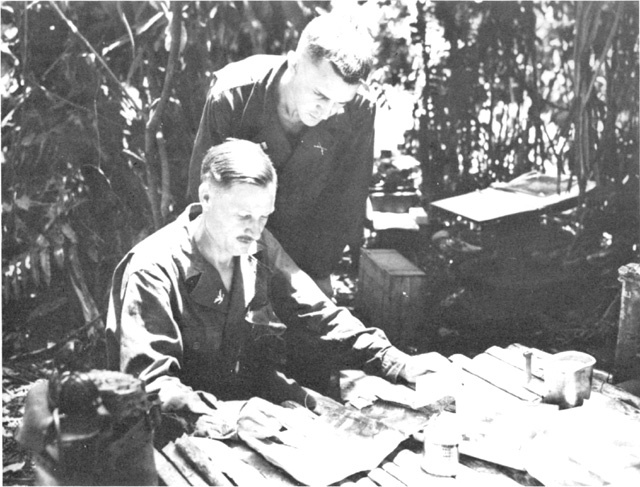 Colonel Grose, seated, studies plans for the next attack. The next morning General Eichelberger ordered Company E, 127th Infantry, to contain the Triangle from the north and Company F, 126th Infantry, to continue blocking it from the south. He then tried a ruse to lead the Japanese into believing that another infantry attack on the Triangle was imminent. To that end, the program of artillery and mortar fire executed the day before was repeated exactly. There were the same five-minute intervals of artillery fire and the same salvos of smoke from the mortars. General Eichelberger reported that evening that he was sure he had killed a large number of the enemy with his "phony attack of artillery and smoke followed by the fixing of bayonets and a cheer." But he had to admit that despite all the artillery and mortar fire that had been laid down on the Japanese positions in the Triangle, and the heavy losses that had been sustained in trying to take it, "our attempts to get the road junction have all failed. "19 The failure to take the Triangle was no great setback since General Eichelberger had already decided upon a more promising axis of attack across Entrance Creek in the area north of the Coconut Grove and the Triangle. Captain Meyer went back to his company and made several attempts to get men across in daylight, but the enemy fire from the other side of the creek proved too heavy. By nightfall the company finally located a heavy rope, and the attempts to cross were renewed. Unbidden, 1st Lt. Edward M. Greene, Jr., picked up one end of the rope, and with several enlisted men started swimming for the opposite shore. Greene was killed almost instantly by enemy fire, and his body was swept away by the current. A few minutes later one of the enlisted men lost his hold on the rope and was swept away. One of the swimmers finally got the rope across the river, and the rest of the night was spent in getting the heavily weighted troops over in the face of the continuing enemy fire. By about 0200 forty-seven men were on the other side of the creek, and when daylight came the total was seventy-five. Company K suffered fifty-four casualties that night--six killed or drowned in the crossing, and eight killed and forty wounded in the fighting at the bridgehead area. While these operations were progressing, there had been a flurry of activity on the left flank. On 18 and 19 December the Schwartz patrol had clashed with enemy patrols west of Siwori Village. On 20 December, upon the insistence of General Herring that the left flank be better secured, Schwartz was reinforced with another twenty men of the 2d Battalion, 126th Infantry, which was in reserve at the time below Buna Village. Schwartz's force, now numbering thirty-five, began moving on its objective, Tarakena, a small village on the west bank of Konombi Creek, about a mile northwest of Siwori Village. FOOTBRIDGE OVER ENTRANCE CREEK to Musita Island. and a machine gun section of Company M, under Lt. Col. Benjamin R. Farrar, then serving as S-3 of the 127th Infantry, moved in to meet the situation. By 1115 the next morning, the last Japanese to be found on the island had been overcome, and Company F, its work done, pulled back to the mainland. On the evening of 23 December, with the bridgehead at the northwest end of Government Gardens firmly secured, General Eichelberger ordered Colonel Grose to attack in an easterly direction across the gardens the following morning. Grose had five companies of the 127th Infantry for the attack. The plan called for the 3d Battalion rifle units to launch the attack, supported by the heavy weapons crews of Company M disposed along Entrance Creek to the rear of the line of departure, with some of the men in trees. Company G would be in reserve and would go into action upon orders from Colonel Grose. The troops on the island and on the village spit laid down heavy fire on the mission during the night, as did the 25-pounders and the 105-mm. howitzer at Ango. The Japanese, in turn, kept the bridgehead under continual harassment, using mountain guns, heavy mortars, and antiaircraft guns depressed for flat-trajectory fire. All along the line of departure the companies remained on the alert throughout the night, but the Japanese made no move either to counterattack or to infiltrate the American lines. the coastal track between Buna Mission and Giropa Point. 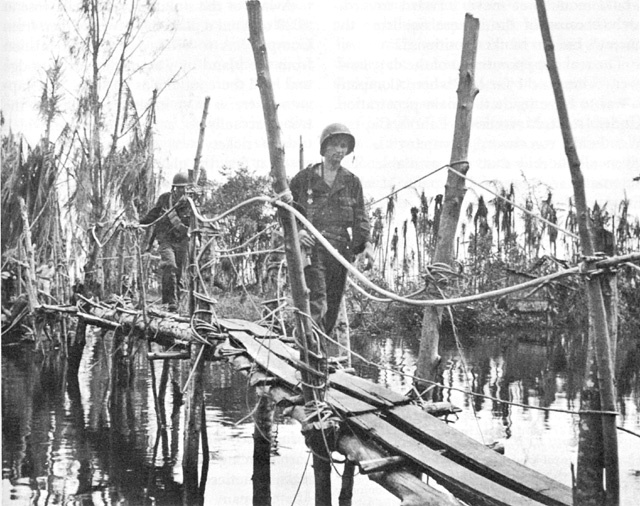 JAPANESE-BUILT BRIDGE to Buna Mission over Entrance Creek. Completely out of touch with its company and the rest of Urbana Force the platoon consolidated and pushed on. By noon it was within sight of the sea, and there its troubles really began. The Japanese started closing in, and the artillery at Ango, unaware that friendly troops were so far forward, shelled the area with great thoroughness, killing Lieutenant Middendorf and wounding Lieutenant Matz slightly. Colonel Grose did not learn of the platoon's break-through until just before noon when a runner got back with the news. He at once ordered Company I back into the line to the right of Company G and sent Company K to the far left with orders to go to the platoon's assistance. The company attacked in the direction it was believed the platoon had followed. Captain Yasuda had meanwhile plugged the hole in his defenses, and it was only after heavy fighting that 1st Lt. Paul M. Krasne and eight men of the company finally broke through. They raced to the beach, found no trace of the Matz patrol, and promptly withdrew lest they be cut off. Colonel Grose now had eight companies of the 127th Infantry at the front--A, C, F, G, I, K, L, and M. His plan was to have Companies A and F attack on the far left and push through to the coast. Companies K and L, in the center of the line, would push forward in their sector in concert with the companies on the left. Companies I and G would concentrate on reducing the bunkers that covered the trail through the gardens and would be aided in that endeavor by a diversionary attack in the afternoon on the Japanese positions in the Triangle. Company C would be in reserve. On Christmas morning, the mortars and artillery in a thunderous barrage gave the mission a thorough working over, and Company H, on the island, made a great show of being about to attack the mission across the north bridge, a makeshift structure that miraculously still stood. At 1135, while the commotion on the island was at its height, Companies A and F attacked across the gardens without preparation of any kind. The ruse worked. Company A (less two platoons which had not yet arrived) was held up, but Company F, which had found it impossible to move forward the day before, found the going relatively easy. Led by Capt. Byron B. Bradford, the company cut its way through the gardens and the swamp and reached the Coconut Plantation by 1345. Obviously caught off base, the Japanese rallied, surrounded the company, and began a counterattack. After beating off the attack with very heavy losses to itself, the company established an all-around perimeter in a triangular cluster of shell holes just outside the plantation. The position was about 200 yards west of the track junction, about 250 from the sea, and 600 from the mission. Things went somewhat better on the 26th. Assisted by Company I, Company G knocked out several bunkers on the right along the trail during the morning and began working on those that remained. On the far left, however, the enemy was still resisting stubbornly, and Company C made no progress all morning. GENERAL EICHELBERGER AND MEMBERS OF HIS STAFF look over newly taken ground in the Triangle area. By the evening of the 28th Urbana Force was able to use the trail through the gardens as far as the Coconut Grove and also controlled the track junction along the coast. Major Schroeder's force was deep in the Coconut Plantation, and Company B, its forward element, was only 120 yards from the sea.62 The corridor from Entrance Creek to the coast had finally been established. Split off from Giropa Point, the mission now lay open to assault. 1. NGF OI No. 53, 16 Dec 42; 2d Bn, 126th Inf, Jnl, 1335, 16 Dec 42; Buna Force FO No. 3, 17 Dec 42; Tel Msg, Urbana Force to Col Howe, Ser 3522, 18 Dec 42. 2. 2d Bn, 126th Inf, Jnl, 1245, 1800, 2200, 18 Dec 42; Tel Msg, Col Bowen to Cols Grose and Tomlinson, Ser 3634, 19 Dec 42; 2d Bn, 128th Inf, Jnl, 0700, 1400, 19 Dec 42. 3. Tel Msg, Col Howe to Buna Force, Ser 3553, 18 Dec 42; Tel Msg, Col Howe to Col Bowen, Ser 3568, 18 Dec 42; Tel Msg, Capt Oliver O. Dixon, S-3 Urbana Force, to G-3 Buna Force, Ser 3580, 18 Dec 42; Tel Msg, Col Tomlinson to Col Bowen, Ser 3582, 18 Dec 42; 2d Bn, 128th Inf, Jnl, 1150, 18 Dec 42; 127th Inf Tact Hist, 18, 19 Dec 42. 4. Buna Force No. 3, 17 Dec 42; Tel Msgs, Col Howe to Col Bowen, Sers 3568, 3647, 19 Dec 42; Tel Msg, Capt Dixon to Col Bradley, Ser 3631, 19 Dec 42; Tel Msg, Col Bowen to Col Tomlinson, Ser 3634, 19 Dec 42. 5. Tel Msg, Col Bradley to Col Howe, Ser 3771, 20 Dec 42; Allied Air Forces Opns Rpts, 19 Dec 42, 20 Dec 42, in G-3 Jnl, GHQ SWPA; Ltr, Gen Eichelberger to Gen Sutherland, 22 Dec 42, copy in OCMH files. 6. Tel Msg, Urbana Force to 32d Div, Ser 3700, 19 Dec 42; 2d Bn, 126th Inf, Jnl, 0715, 0745, 0945, 1250, 19 Dec 42; 126th Inf, Jnl, Ser 20, 19 Dec 42; Ltr, Gen Eichelberger to Gen Sutherland, 19 Dec 42, copy in OCMH files; Rpt, CG Buna Forces, p. 29. Captain Boice, who was at the very head of his troops when he met his death, was posthumously awarded the Distinguished Service Cross. The citation is in GHQ SWPA GO No. 3, 6 Jan 43. 7. Tel Msg, Urbana Force to 32d Div, Ser 3700, 19 Dec 42; 2d Bn, 126th Inf Jnl, 0715, 0730, 0745, 0945, 1250, 1600, 19 Dec 42; 126th Inf Jnl, Ser 35, 19 Dec 42; Ltr, Gen Eichelberger to Gen Sutherland, 19 Dec 42; 126th Inf CT AAR, Papuan Campaign. 8. 32d Div Sitrep, No. 111, 19 Dec 42; 2d Bn, 126th Inf, Jnl, 0200, 0700, 1700, 20 Dec 42; 126th Inf Jnl, Ser 20, 20 Dec 42; 127th Inf Tact Hist, 20 Dec 42. 9. Tel Msg, Col Bowen to Col Tomlinson, Ser 3711, 19 Dec 42; 126th Inf Jnl, Ser 36, 19 Dec 42. 10. 126th Inf Jnl, Ser 2, 20 Dec 42; Ltr, Gen Eichelberger to Gen Sutherland, 20 Dec 42, copy in OCMH files; 127th Inf Tact Hist, 20 Dec 42. 11. 127th Inf Tact Hist, 20 Dec 42. 12. 126th Inf Jnl, Ser 13, 20 Dec 42; Ltr, Gen Eichelberger to Gen Sutherland, 20 Dec 42; 127th Inf Tact Hist, 20 Dec 42. Rehak was posthumously awarded the Distinguished Service Cross, and the two lieutenants, the Silver Star. Rehak's citation is in GHQ SWPA GO No. 4, 10 Jan 43; Feury's and Whittaker's in GO No. 14, 30 Jan 43. 13. 126th Inf Jnl, Sers 8, 9, 13, 18, 20 Dec 42; 127th Inf Tact Hist, 20 Dec 42. 14. 126th Inf Jnl, Sers 17, 21, 20 Dec 42; 127th Inf Jnl, 1700, 20 Dec 42; 127th Inf Tact Hist, 20 Dec 42. Though no longer commander of Urbana Force, Tomlinson continued as commander of the 126th Infantry. Reporting the change to General Sutherland that night, General Eichelberger wrote, "I am going to bring Tomlinson in here for a day or so to rest him up." Ltr, Gen Eichelberger to Gen Sutherland, 20 Dec 42. 15. Ltr, Gen Eichelberger to Gen Sutherland, 20 Dec 42; Interv with Gen Eichelberger, 26 Apr 50. 16. Tel Msg, Brig Hopkins to Col Bowen, Ser 3791, 20 Dec 42; Msg, Adv NGF to CG Buna Force, Ser 3808, 20 Dec 42, in 32d Div G-3 Jnl; Ltr, Gen Eichelberger to Gen MacArthur, 26 Dec 42, copy in OCMH files. 17. Ltr, Gen Eichelberger to Gen Sutherland, 20 Dec 42. 18. Tel Msg, Col Bowen to Col Grose, Ser 3793, 20 Dec 42; Ltr, Gen Eichelberger to Gen Sutherland, 21 Dec 42, copy in OCMH files; 127th Inf Tact Hist, 22 Dec 42. 19. Ltr, Gen Eichelberger to Gen Sutherland, 21 Dec 42. 20. Ltr, Gen Eichelberger to Gen Sutherland, 20 Dec 42; 127th Inf Jnl, 0800, 21 Dec 42; Interv with Col Grose, 15 Nov 50; Ltr, Gen Eichelberger to author, 15 Jan 52. 21. 127th Inf Jnl, 0800, 21 Dec 42; 127th Inf Tact Hist, 21 Dec 42; Ltr, Col Grose to Gen Ward, 26 Feb 51; Ltr, [Capt] Alfred E. Meyer to author, 13 Mar 51. 22. Col Grose's Diary, 21 Dec 42; Intervs with Col Grose, 15 Nov 50, 1 Feb 51; Ltr, Gen Eichelberger to author, 15 Jan 52. 23. Ltr, Capt Meyer to author, 13 Mar 51; Interv with Col Grose, 18 Nov 50; Ltr, Col Grose to Gen Ward, 2 Feb 51. 24. 127th Inf Jnl, 2130, 21 Dec 42, 0630, 22 Dec 42; 127th Inf Tact Hist, 22 Dec 42; Tel Conv, Col Bowen with Col Grose, Ser 3911, 22 Dec 42; Col Grose's Dairy, 22 Dec 42; Interv with Col Grose, 15 Nov 50; Ltr, Meyer to author, 13 Mar 51. 25. Ltr, Maj Robert P. McCampell to author, 18 Jan 51; "A Case History," Time, 4 Dec 44, p. 68. 26. Ltr, Gen Eichelberger to Gen Sutherland, 24 Dec 42, copy in OCMH files. The reference is to the Command and General Staff College at Fort Leavenworth, Kansas. 27. Tel Msg, Urbana Force to G-3 32d Div, Ser 3577, 18 Dec 42; Tel Msg, Col Howe to Col Bowen, Ser 3647, 19 Dec 42; Tel Msg, Brig R. N. L. Hopkins, CofS, Adv NGF, to Col Bowen, Ser 3791, 20 Dec 42; Msg, Adv NGF to Buna Force, Ser 3808, 20 Dec 42; Tel Msg, Urbana Force to G-3 Buna Force, Ser 3837, 20 Dec 42; Tel Msg, Col Grose to Col Howe, Ser 3833, 21 Dec 42; 127th Inf Jnl, 0815, 1550, 21 Dec 42. 28. 2d Bn, 126th Inf, Jnl, 22 Dec 42; 127th Inf Jnl, 0800, 0940, 0945, 1805, 2010, 2020, 22 Dec 42, 0800, 23 Dec 42; 127th Inf Tact Hist, 22 Dec 42, 23 Dec 42. 29. Tel Msg, Col Bradley to Col Howe, Sers 3942, 3945, 22 Dec 42; Tel Msg, Col Howe to Col Grose, Ser 3949, 22 Dec 42; 127th Inf Tact Hist, 22 Dec 42; 127th Inf Jnl, 1015, 23 Dec 42. 30. Ltr, Gen Eichelberger to Gen Sutherland, 22 Dec 42. 31. Ltrs, Gen Eichelberger to Gen MacArthur, 23 Dec 42, 24 Dec 42, copies in OCMH files; 127th Inf Tact Hist, 23 Dec 42, 24 Dec 42; 127th Inf Jnl 0956, 24 Dec 42; Ltr, Col Grose to Gen Ward, 26 Feb 51. 32. 127th Inf Tact Hist, 23 Dec 42, 24 Dec 42; 127th Inf Jnl, 0956, 24 Dec 42; G-3 Sitrep Buna Force, 23 Dec 42; 32d Div Sitrep No. 121, 24 Dec 42; Ltrs, Gen Eichelberger to Gen MacArthur, 24 Dec 42, 25 Dec 42, copies in OCMH files; Rpt CG Bura Forces, p. 31. 33. 32d Div Overlay, 24 Dec 42, in 32d Div Overlays, Papuan Campaign; Buna Defense Plan, Japanese, in Rpt, CG Buna Forces; Interv with General Eichelberger, 26 Apr 50; Ltr, Col Gordon B. Rogers to author, 26 Jun 50. 34. Ltr, Maj McCampbell to author, 26 Aug 50. 35. 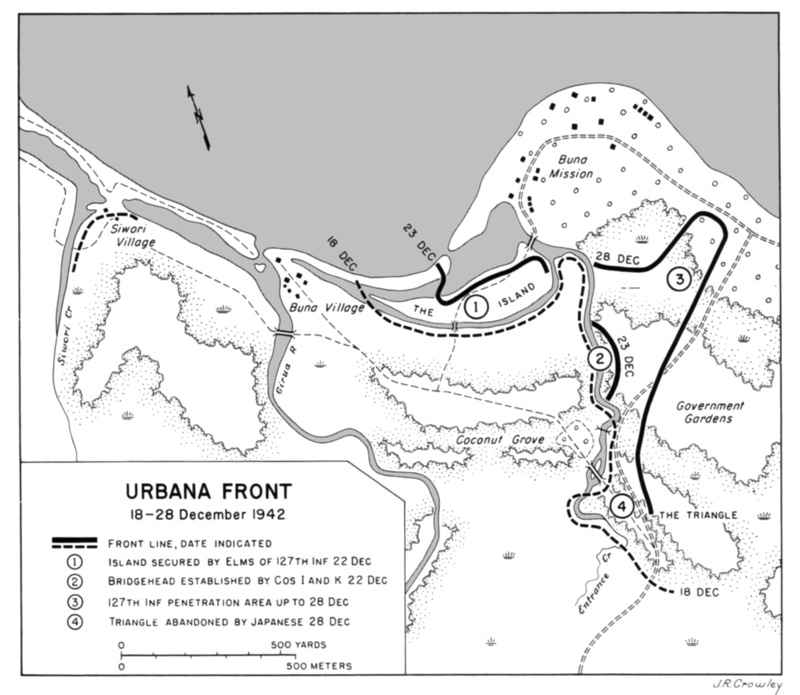 G-3 Sitrep, Buna Force, 23-24 Dec; Tel Msg, Urbana Force to G-3 Buna Force, Ser 4112, 24 Dec 42; 127th Inf Tact Hist, 24 Dec 42. 36. WD GO No. 66, 11 Oct 43. On the same day, 24 December 1942, another member of the company, Pfc. Albert L. Fisher, who had been evacuated for treatment of his wounds to a point just behind the front line, saw two men of his unit lying wounded in an area swept by enemy fire. Disregarding his wounds and the continuing enemy fire, Fisher crawled into the open and dragged both men to safety. He was later awarded the Distinguished Service Cross. The citation is in Hq USAFFE GO No. 36, 1 Jul 43. 37. 127th Inf Jnl, 0610, 24 Dec 42; Col Grose's Diary, 24 Dec 42; Ltr, Col Grose to Gen Ward, 26 Feb 51. 38. Tel Msgs, Col Bradley to Col Howe, Ser No. 4088, 24 Dec 42, Ser 4090, 24 Dec 42, Ser 4093, 24 Dec 42, Ser 4099, 24 Dec 42; 127th Inf Jnl, 0950, 24 Dec 42; 127th Inf Tact Hist, 24 Dec 42. Eichelberger, Our Jungle Road to Tokyo, p. 42. Actually it was a sergeant from Company I, Sgt. 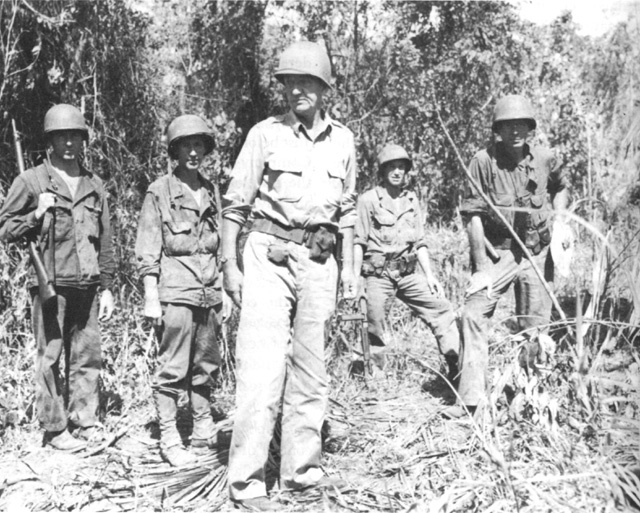 Francis J. Vondracek, with the help of members of Company G, who cleared out the strongpoint. When Company G took over from Company I, Vondracek, an acting platoon leader of Company I, remained behind at his own request. Covered by rifle fire from Company G, he knocked out the three bunkers in quick succession by flinging hand grenades through their firing apertures. Vondracek was later awarded the Distinguished Service Cross. The citation is in Hq USAFFE GO No. 34, 21 Jun 43. 39. Rpt, CG Buna Forces, p. 31; 127th Inf Tact Hist, 24 Dec 42. Colonel McCreary directed the fire of the mortars personally most of the day from a coconut tree about fifty yards from the enemy lines--the only good observation post he could find. Though wounded in the back by a shell fragment, he strapped himself in his tree and continued to direct the mortars until he lapsed into unconsciousness from loss of blood and had to be evacuated. Colonel Harding, who was at the front inspecting the artillery, thereupon took over direction of the mortar fire using the same tree Colonel McCreary had just vacated. Both colonels were later awarded the Distinguished Service Cross. McCreary's citation is in GHQ SWPA GO No. 2, 2 Jan 43; Harding's in GO No. 4, 10 Jan 43. 40. 127th Inf Jnl, 1028, 1430, 1442, 24 Dec 42; Interv with Col Grose, 15 Nov 50; Ltr, Col Grose to Gen Ward, 26 Feb 51. Neither Colonel Grose nor General Eichelberger knew of his presence, but Brig. Gen. Spencer B. Akin, General MacArthur's signal officer, was on the island for a few minutes during the forenoon. Before he left, he saw American troops walking erect in the mission area. Shortly thereafter General Eichelberger began receiving congratulations on having taken the mission. Exceedingly wroth, Eichelberger not only refused to accept the congratulations but demanded an immediate explanation of the matter from Colonel Grose, who, until he learned that General Akin had been present on the island, was at a loss to understand what General Eichelberger was talking about. 41. Tel Msg, Urbana Force to Col Bowen, Ser 4112, 24 Dec 42; Tel Msg, Col Bradley to Col Bowen, Ser 4125, 24 Dec 42; 127th Inf Tact Hist, 24 Dec 42; Col Grose's Diary, 24 Dec 42; Ltr, Gen Eichelberger to Gen MacArthur, 25 Dec 42; Ltr Col Grose to Gen Ward, 26 Feb 51. Gruennert's citation for the Medal of Honor is in WD GO No 66, 11 Oct 43. 42. Tel Msg, Col Bowen to 32d Div, Ser 4124, 24 Dec 42; 127th Inf Tact Hist, 24 Dec 42; 127th Inf Jnl, 1400, 26 Dec 42; Ltr, Meyer to author, 13 Mar 51. Matz was later awarded the Distinguished Service Cross. The citation is in Hq USAFFE GO No. 34, 21 Jun 43. 43. Tel Msg, Col Bowen to Col Howe, Ser 4124, 24 Dec 42; Tel Msg, Col Bradley to Col Bowen, Ser 4125, 24 Dec 42; 127th Inf Tact Hist, 24 Dec 42; Ltrs, Gen Eichelberger to Gen MacArthur, 24 Dec 42, 25 Dec 42; Col Grose's Diary, 24 Dec 42; Interv with Col Grose, 18 Nov 50; Rpt, CG Buna Forces, p. 31. 44. Ltr, Gen Eichelberger to Gen MacArthur, 25 Dec 42. 45. Tel Msg, Col Grose to Col Bowen, Ser 4146, 24 Dec 42; Tel Msg, Col Bowen to Col Grose, Ser 4148, 24 Dec 42; 127th Inf Tact Hist, 25 Dec 42. 46. Tel Msgs, Col Bradley to Col Howe, Ser 4205, 25 Dec 42, Ser 4220, 25 Dec 42; Tel Msg, Col Grose to Col Howe, Ser 4228, 25 Dec 42; Tel Msg, Capt Stephen Hewitt, S-2, 127th Inf, to Maj Hawkins, G-2, 32d Div, Ser 4270, 26 Dec 42; 127th Inf Jnl, 1110, 1130, 1135, 25 Dec 42; 127th Inf Tact Hist, 26 Dec 42, 27 Dec 42; 32d Div Sitrep, No. 124, 25 Dec 42. 47. Tel Msg, Col Bradley to 32d Div, Ser 4220, 25 Dec 42; 32d Div Sitrep, No. 124, 25 Dec 42. Workman was posthumously awarded the Distinguished Service Cross. The citation is in Hq USAFFE GO No. 32, 15 Jan 43. 48. 127th Inf Tact Hist, 25 Dec 42; 32d Div Overlays, Papuan Campaign, 25 Dec 42; Col Grose's Diary, 25 Dec 42. 49. 127th Inf Tact Hist, 25 Dec 42; Tel Msg, Col Bradley to Col Howe, Ser 4316, 26 Dec 42. Eoff, Balza, and Fale were later awarded the Distinguished Service Cross. Eoff's citation is in Hq USAFFE GO No. 36, 1 Jul 43; Balza's in GO No. 34, 21 Jun 43; Fale's, in GHQ SWPA GO No. 29, 30 Mar 43. 50. Ltr, Col Grose to Gen Ward, 26 Feb 51; 32d Div Overlays, Papuan Campaign, 26 Dec 42. There were no facilities for resting the troops. "It was difficult," Colonel Grose recalls, "to find a dry spot for this purpose, and since there were no tents or other shelter, the men were quite often wet from rain even when resting. The relief from the tensions of the front was a help. I found that this system worked, and continued to use it all the way through, despite the fact that there were those in the higher echelons who insisted that all the men needed was proper leadership." 51. Tel Msgs, Col Bradley to 32d Div, Ser 4205, 25 Dec 42, Ser 4220, 25 Dec 42; Tel Msg, Urbana Force to Col Bowen, Ser 4260, 26 Dec 42; 32d Div Overlays, Papuan Campaign, 26 Dec 42. 52. 127th Inf Jnl, 1113, 1115, 1205, 1215, 1230, 1245, 26 Dec 42; 127th Inf Tact Hist, 26 Dec 42; Ltr, Col Grose to Gen Ward, 26 Feb 51. 53. 127th Inf Jnl, 1745, 26 Dec 42; Ltr, Maj McCampbell to author, 26 Aug 50; Ltr, Col Grose to Gen Ward, 26 Feb 51. Bradley, Schroeder, and McCampbell were all later decorated for getting through to the surrounded companies: Schroeder and McCampbell with the Distinguished Service Cross; Bradley with the Silver Star. Schroeder's citation is in GHQ SWPA GO No. 14, 30 Jan 43; McCampbell's is in Hq USAFFE GO No. 34, 21 Jun 43; Bradley's is in Hq U.S. Forces Buna Area GO No. 7, 14 Jan 43. 54. Ltr, Maj McCampbell to author, 26 Aug 50. 55. Tel Msg, Col Bradley to Col Howe, Ser 4361, 26 Dec 42; Interv with Col Grose, 18 Nov 50. In a letter he wrote to General Sutherland and then decided not to send, General Eichelberger noted the situation as Colonel Bradley reported it to him personally. It was to the effect that Company F had been "practically wiped out," and that the detachment of Company A had received "numerous casualties." "I must be frank, however, and tell you," he continued, "that the first two companies have taken tremendous losses, and everyone on the Urbana front has recommended that we reorganize and substitute two fresh companies of [them]." "I believe," he added, "that the greater part of the Japanese strength has been on our two forward companies." Ltr, Gen Eichelberger to Gen Sutherland, 27 Dec 42, marked "not sent," copy in OCMH files. 56. 127th Inf Jnl, 0200, 0830, 1500, 1525, 27 Dec 42, 0826, 28 Dec 42; 127th Inf Tact Hist, 27 Dec 42, 28 Dec 42; 32d Div Overlay, Papuan Campaign, 27 Dec 42, 28 Dec 42. Capt. Millard G. Gray, General Eichelberger's new aide-de-camp who was in command of Company C between 24 December and 1 January, was later awarded the Distinguished Service Cross. The citation is in Hq USAFFE GO No. 51, 30 Aug 43. 57. Ltr, Maj McCampbell to author, 26 Aug 50. 58. 127th Inf Jnl, 0750, 1131, 28 Dec 42; 127th Inf Tact Hist, 28 Dec 42; Interv with Col Grose, 18 Nov 50. Colonel Bradley, who had been in the front lines with Company C all morning directing the advance and urging the men forward, was later awarded the Distinguished Service Cross. The citation is in Hq USAFFE GO No. 36, 1 Jul 43. 59. 127TH Inf Tact Hist, 28 Dec 42. 60. 127th Inf Jnl, 1755, 28 Dec 42; 127th Inf Tact Hist, 28 Dec 42. 61. Ltr, Gen Eichelberger to Gen Sutherland, 29 Dec 42, copy in OCMH files. 62. Tel Msg, Gen Eichelberger to Col Howe, Ser 4487, 28 Dec 42; 32d Div G-3 Daily Periodic Rpt, 28 Dec 42.